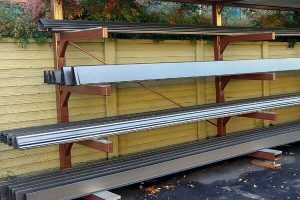 Kobett Metals is excited to announce that we have recently completed the infrastructure upgrades needed to accommodate a larger inventory of Bonderized Steel Rain Gutter material. We are providing the finest quality of Bonderized Steel Rain Gutters, Downspouts and steel roofing materials in the industry. Also known as “Paint Grip Steel”, bonderized steel is a type of galvanized steel that is treated with a phosphate bath and chromate dry. The resulting effect is a dull grey surface that is non-corrosive and has a micro-porous surface that acts as a primer, making it ready for the application of paint. The phosphate process also provides an insulation within the galvanized coating and the paint, which makes the adhesion to the steel longer lasting. It’s advised to paint bonderized steel immediately after installation since the exposed phosphate coating is susceptible to white rust. Due to the properties zinc phosphate creates, it is a popular choice for the roofing and gutter industry and perfect for rain gutters, downspouts, flashing and other materials that can be painted right on site. Contact Kobett Metals to learn more about our expanded line of bonderized roofing and gutter materials. 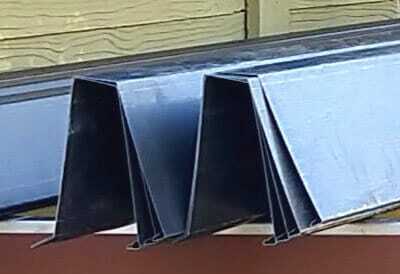 Rain Gutters: a) 4″, 5″, and 6″ Ogee Bonderized Steel with Wing — 20ft, 25ft, and 30ft b) 5 1/4″ Plain Fascia, Curved Fascia, and Decco Fascia with Wing — 20ft, 25ft, and 30ft c) 7 1/4′ Plain Fascia, Curved Fascia, and Decco Fascia with Wing — 20ft and 25ft ** 7 1/4″ Plain, Curved, or Decco also available in 30ft (special order) ** **Tile Style Bonderized Steel Gutter also available through Special Order* * Downspouts: a) 1 3/4″ x 2 3/4″ Rectangular Bonderized Steel in both 10ft and 11 ft lengths b) 2″ Round Bonderized Steel — 10 ft pipes c) 2″ x 3″ Rectangular Bonderized Steel in both loft and 11 ft lengths d) 3″ Round Bonderized Steel — 10 ft pipes e) 3″ x 4″ Bonderized Steel — 10 ft pipes f) 4″ x 6″ Bonderized Steel — 10ft pipes We also maintain a large inventory of Galvanized, Bonderized, Stainless Steel, and Zinc Sheets — 24 Gauge and 26 Gauge.